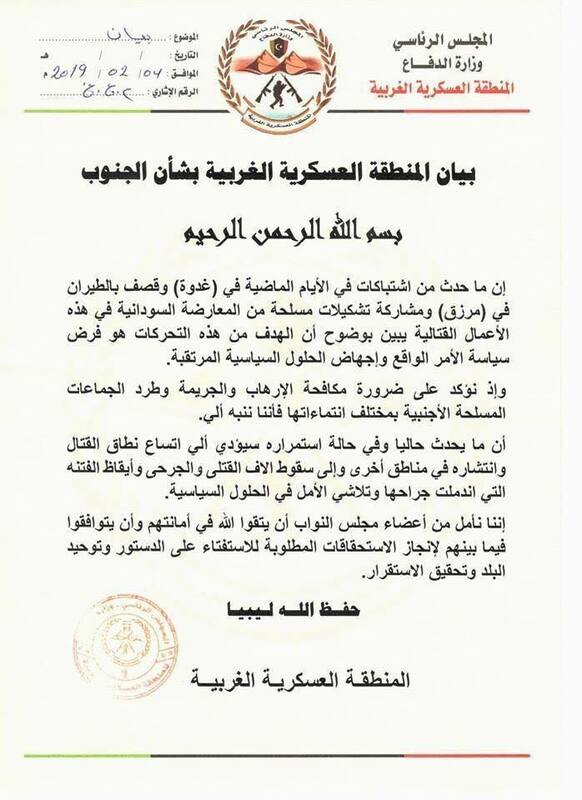 The Western Military Zone of the Presidential Council said that the hostile acts that took place in the past days in the area of Ghadwa -southeast of Sabha- including the bombing of Murzuk and the interference of armed groups of Sudanese opposition groups in the hostilities, clearly shows that the aim of these moves is to impose a policy of fait accompli, and defeat any political solutions. In a statement on the issue, the Western Military Zone emphasized the need to combat terrorism and crime and to dislodge foreign armed groups from Libyan territory. "What is taking place at the present, and should it continue, will lead to extensive fighting that will expand to other regions, let alone the casualties it will cause and the inciting of dissension and strife, demolishing any hope of a political solution," the statement read. It also called on the HoR members to live up to the expectations held on them by preserving what they were entrusted for, and to agree among themselves in order to achieve the entitlements required for the constitutional referendum and the unification of the country. Armed groups affiliated to Khalifa Haftar backed by mercenaries from the Sudanese Justice and Equality movement has launched an attack on armed groups in the area of Ghadwa, claiming they belong to Chadian opposition groups, while independent evaluators and Tabu figures confirmed that those targeted were of Tabu tribes living in the area. The recent days experienced a wave of resignations and protests by Tabu officials in the east-based Interim Government and the parliament, in protest at what they called the ethnic cleansing carried out by Haftar's forces against Tabu community.